﻿ The Inter-American Program of the University of Florida .. 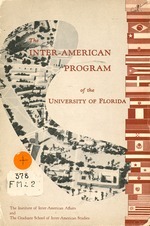 The Inter-American Program of the University of Florida ..
21 p. : illus. ; 24 cm. The Institute of Inter-American Affairs and the Graduate School of Inter-American Studies. the flags of the twenty-one American republics. by adding to our knowledge concerning these countries. expansion of opportunities for graduate study and research. quality of the source materials available in written form. phases of the Latin American program of the University. plaza. The flags of all the republics are displayed on the Plaza on appropriate occasions. John Fletcher Martin (far right), in charge of exchange of Latin American students at the University. American students currently receive scholarships. University, it is planned to resume them in the near future. Architect's sketch of the proposed Inter-American House. interest of the University in Latin America. success, and these the Inter-American House will provide. IN ITS COLONIAL HERITAGE, Florida is a part of Latin America. Florida was a strategically located-if unfruitful-colony. Spain as a bastion against French, English, or Dutch corsairs. English from the Carolinas and the French from Louisiana. Governor of the Spanish Province of East Florida. of North and South America. to the problems encountered in their own countries. research activities on the part of faculty and students. more widely accurate information about Latin America. of knowledge about this country. Music, Political Science, Sociology, and Spanish. (Literature), John M. Goggin (Anthropology), Francis C.
and several hundred articles in the Inter-American field. These contributions represent research in all the fields named. ied various phases of engineering at the University of Florida. Guy Inman, Juan Clemente Zamora, and John A. Crow. senior members of the staff also teach in the Graduate Division. programs concerned with Latin America. of the topic. Some of these courses are listed subsequently. to prepare public school administrators. as beach erosion, treats subjects of interest to Latin America. offering work leading to the LL.B. degree. jurisdiction over the various programs leading to the M.A. and Ph.D.
research which pertain to Latin America. 424-MINOR SUBTROPICAL AND TROPICAL FRUITS. 437-CITRUS MATURITY AND PACKINGHOUSE PROCEDURE. farms and other agricultural enterprises throughout Florida. the West Florida Station at Milton. 296-INDUSTRY AND TRADE OF LATIN AMERICA. 385-ECONOMIC GEOGRAPHY OF SOUTH AMERICA. 386-EcoNOMIC GEOGRAPHY OF CARIBBEAN AMERICA. 545-THE ECONOMY OF LATIN AMERICA. 363-364-SURVEY OF LATIN AMERICAN HISTORY. 373-MEXICO AND THE CARIBBEAN AREA. 587-588-SEMINAR IN LATIN AMERICAN HISTORY. 410-THE GOVERNMENTS OF LATIN AMERICA. 440-INTERNATIONAL RELATIONS OF AMERICAN REPUBLICS. 531-532-SEMINAR IN LATIN AMERICAN GOVERNMENT AND POLITICS. 303-304-SURVEY OF PORTUGUESE AND BRAZILIAN LITERATURE. 364--PEOPLES, CULTURES, AND SOCIAL INSTITUTIONS OF SPANISH AMERICA. 365-PEOPLES, CULTURES, AND SOCIAL INSTITUTIONS OF BRAZIL. 564-PEOPLES, CULTURES, AND SOCIAL INSTITUTIONS OF SPANISH AMERICA. 565-PEOPLES, CULTURES, AND SOCIAL INSTITUTIONS OF BRAZIL. 451-COLONIAL LITERATURE OF LATIN AMERICA. 453-THE ROMANTIC MOVEMENT IN LATIN AMERICA. 454-THE REALISTIC MOVEMENT IN LATIN AMERICA. 520-SPANISH AND LATIN AMERICAN LITERATURE IN TRANSLATION.